Yes, we did it! 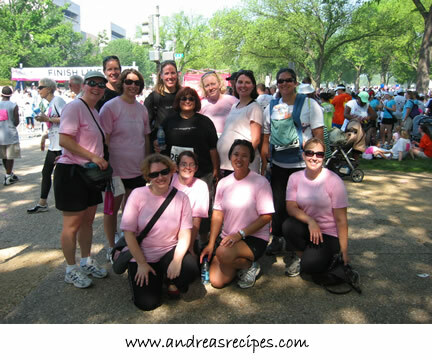 On Saturday morning Team DC Metro Moms Blog joined thousands of others running/walking/strolling for the Cure in downtown DC. The company was fantastic and we had a wonderful time while raising money for the Susan G. Komen Foundation. The day was a scorcher with high humidity, but the misting tents were up and we made sure to hit every one of them, sometimes twice. It was great to catch up with moms I already knew and meet new ones! This is a cool bunch of gals to hang with. Hopefully we can get together again soon Robin, Jean, Linda, Devra, Jess, Mama Bird, Jessica, Nancy, Sandie, Leticia, Jodifur, Julie, and Sarah! And I missed seeing Susan, Suzie, and Mary, but I’m sure we’ll catch up! After all our racing and brunch festivities were done, I went home and drank gallons of Gatorade, then started getting ready for Top Gun’s birthday party which was yesterday. Michael and I tag team making the birthday cakes, so I did my part baking and mixing up three batches of frosting Saturday night (aside: I kept nodding off and it took me till 3:30 am to finish it all) then Michael put his aerospace engineering skills to use and designed an airplane cake on Sunday morning! Top Gun was thrilled with his cake, and I’ll have a post up about it sometime soon. Congrats on a walk well done! I’m glad to know there are so many amazing women (and men) out there willing to put in some hard time to attempt to bring change. I can’t wait to see your post about the cake – your family always has the most amazing birthday cakes. Whoa! 3:30am and an airplane cake?! You guys rock. I can’t wait to see the pics/instructions. Also, it was wonderful to get a chance to talk to you! Hope the party was great. Woo-hoo! That’s cause for celebration, indeed, Andrea! I’m so glad I got to experience the walk with everyone. My recap will be up tomorrow. I can’t believe you were up until 3:30 cooking. You are truly supermom! It was great to walk with you! That is always something I greatly enjoyed. Wonderful to get together and feel good with great people for a terrific cause. Can’t wait to see this cake! Happy Birthday to the top gun!